The Darkness features a distinct blend of dark modern crime drama and supernatural horror with intense first person non-linear gameplay. 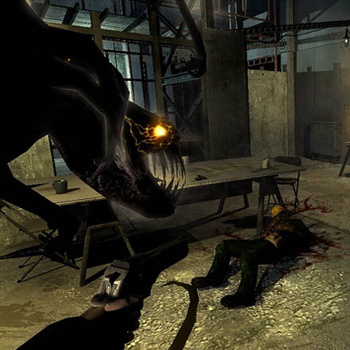 The game is a dynamic first person shooter that allows players to call upon the forces of the evil underworld as they fight in gritty, urban environments. Armed with an arsenal of guns, gamers battle an array of demonic creatures and supernatural powers. In the game, players assume the role of mafia hitman Jackie Estacado. On the night of his 21st birthday, Jackie is possessed by "The Darkness," an ancient demonic entity that gives Jackie spectacular powers. The story, written by Eisner Award winner Paul Jenkins, follows Jackie and his fight with the fictional Francetti mafia. As the story unfolds, the player will learn to utilize traditional weapons and the extraordinary powers of The Darkness.